At Remedy Columbia we believe wellness comes from a holistic & patient-centered approach, so we have developed a unique experience for getting you the natural medicine you need. Our legacy began in 1974. Our founder, Robert M. Duggan, established the first acupuncture and alternative medicine school in Columbia at a time when acupuncture was legal in only two states nationwide. Introduced to wellness at an early age, we have over forty years of experience in the art and science of integrative medicine, helping countless patients with cancer, pain, and addiction. We believe knowledge is healing. Bob Duggan said "wellness is a conversation". We pass this lesson on to our staff in a continuous education and training process. Our friendly, professional staff will guide you through your options and any questions you might have. Whatever your conditions or ailments--chronic pain, anxiety, depression, hypertension, or nausea from chemotherapy--our team will assist you in selecting a path to relief and wellness. At Remedy Columbia you are in the hands of experienced healers. And because Remedy Columbia is locally owned and operated by Howard County professionals, students, parents and active community members, we understand you. We are fortunate to have deep roots in such a diverse, vibrant city and we want to give back to our community with the gift of natural medicine and scientific breakthroughs. We are committed to deliver safe, natural medicine directly to you--garden fresh with care and kindness. CURATED, COMMUNITY, AND COMPASSION. EXPERIENCE RELIEF AT REMEDY. Our mission is to provide Maryland registered Medical Cannabis patients with access to the highest quality, most efficacious, and most carefully selected medications to relieve their ailments in a safe, welcoming, and comfortable environment. 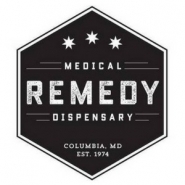 Our vision at Remedy is to become Maryland’s leader in medical cannabis supply and support.